How Realistic Are the Firearms in ‘Battlefield 1′? For once, Internet rumors have proved true. Swedish video-game developer DICE, a subsidiary of EA, is looking to the past for the setting of the newest installation in its Battlefield series of first-person shooters. But how realistic are the weapons in Battlefield 1? It turns out — pretty realistic for a game of this sort. But there are a couple of odd anachronisms. DICE launched the Battlefield series back in 2002 with Battlefield 1942, set during World War II. Most of the Battlefield games are set in the present or future, but one takes place during the Vietnam War. As such, the Battlefield series has a history with, ahem, history. Today in 2016 we’re in the middle of the Great War centennial — and this no doubt inspired DICE’s decision to set Battlefield 1 during World War I. It’s also possible that the developers hoped to recreate the success of the excellent multiplayer game Verdun, which recreates the eponymous 1916 battle. Having played some of their earlier games — namely Battlefield: Bad Company 2: Vietnam — and having been impressed with the level accuracy and detail, I decided to take a close look at some of the weapons that appear in the 60-second teaser trailer DICE recently released for Battlefield 1. 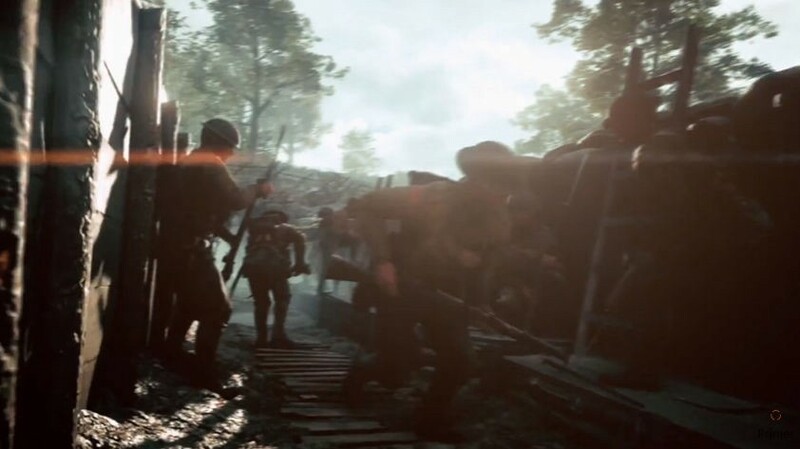 In the first 10 seconds of the trailer, we see what looks to be a German soldier wearing a Gaede helmet and a gas mask and bludgeoning an enemy with a trench club. A short while later, the trailer cuts to what appears to be a sabre-wielding Arab horseman charging through a desert. All pretty convincing. 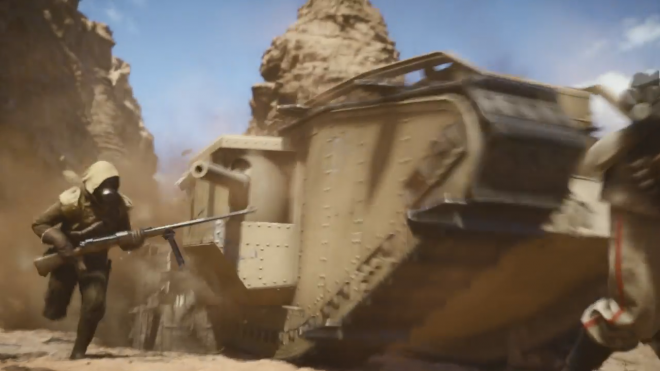 Thirteen seconds into the trailer, there’s a spectacular aerial shot of a Western Front battlefield from over the shoulder of an observer manning what appears to be a Mk. II Aerial Lewis Gun. 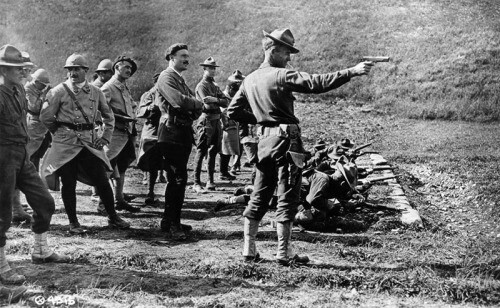 Another scene again shows a Gaede-wearing German dispatching an apparent American infantryman armed with what could be a Winchester M1897 Trench Gun or, alternatively, a Remington Model 10A Trench Gun, which the U.S. Marine Corps deployed in limited numbers during World War I. The shotgun’s profile — it doesn’t appear to have an exposed hammer like the Winchester does — and its bayonet lug indicate it’s the latter weapon. However, the weapon lacks the wooden heat shield which fit to the top of the Model 10A’s barrel. The pump handle also appears to be missing! The trailer features a series of aerial dogfights over a number of different theaters. Twenty seconds in, we see a red German plane — possibly a Fokker Dr.I — chase an Allied biplane through a canyon, ultimately destroying it with its MG 08/15 Maxim machine guns. 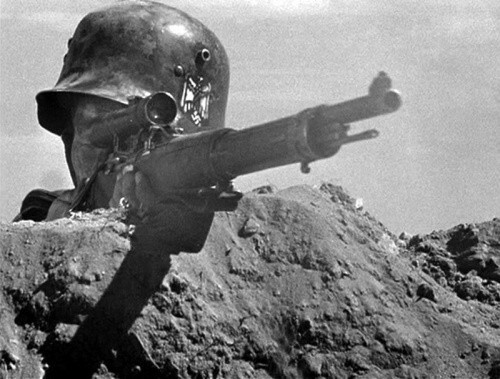 At the 25-second mark, the world’s first anti-tank rifle — the German T-Gewehr — is briefly visible. A soldier sprints beside a British Mk. IV Male tank — which, by the way, is moving far too fast to be realistic. It’s quite the feat, considering the T-Gewehr weighed 41 pounds! 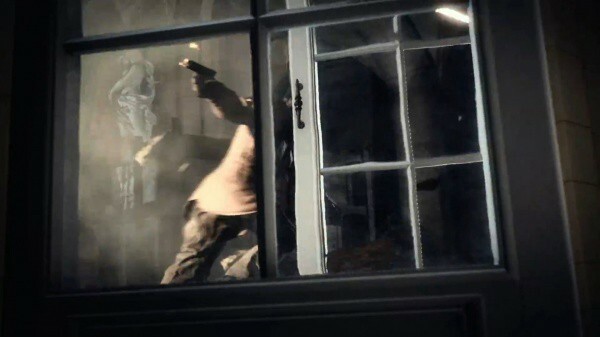 Halfway through the trailer, there’s a brief glimpse of a 1911 pistol. This scene also hints that the game could involve more than just trench combat. 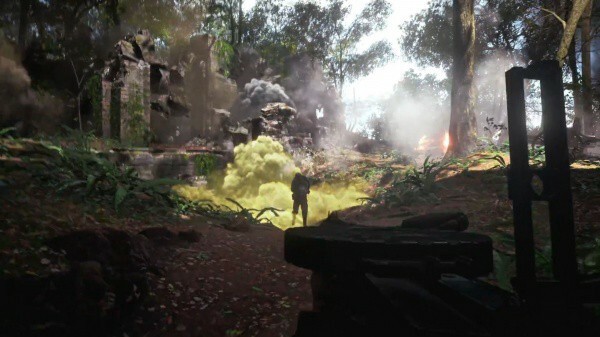 At the trailer’s midpoint, we finally get our first glimpses of gas warfare. A shattered ruin collapses under artillery fire and a Lewis Gun operator blasts a German infantryman before donning a gas mask. The trailer cuts to a group of what seem to be Italian infantry wearing Adrian helmet — and getting brutally cut down by machine-gun fire. The carbines they carry are the trailer’s first mystery. They’re not quite Carcanos, but what else would Italian troops be carrying in 1916? The weapons lack the Carcano’s curved bolt handle, folding bayonet and magazine — but no other weapon fits the bill. Maybe this represents a rare oversight in DICE’s game design. Or maybe the weapon we see in the trailer is a placeholder for a gun that the designers are still working on rendering. At 38 seconds, the iconic British Short Magazine Lee-Enfield makes an appearance as the camera pans across a trench full of British troops scrambling to fix bayonets. 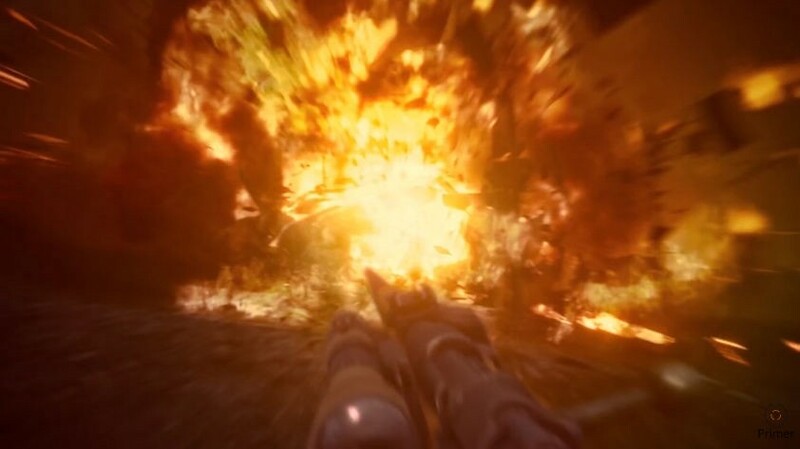 For a split-second as a building explodes, we catch a glimpse of a sniper’s scope-equipped Gewehr 98 rifle. 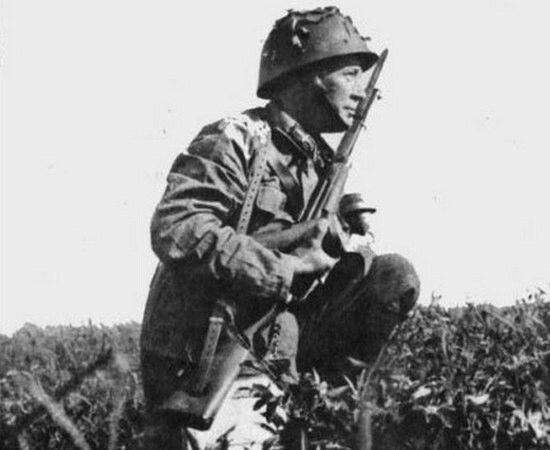 It’s difficult to see quite what this unrealistically armor-clad soldier is hip-firing, but it’s probably either a MG08/15 or possibly a Bergmann MG15nA — which had a carrying handle — as these were the only light machine guns Germany used during the war. This brief scene concerns me, as the armor looks more like something from the 15th century than from World War I. 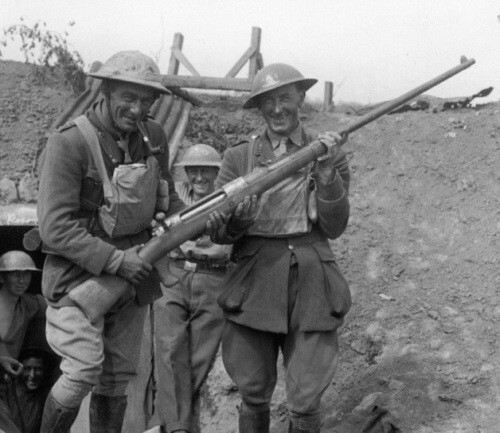 Not only that, the MG 08/15 weighed nearly 40 pounds, so it was impossible to fire from the hip for very long. 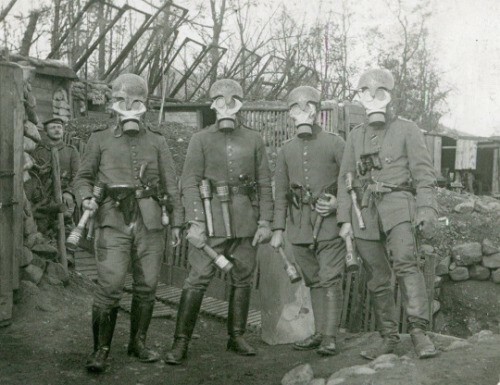 While it’s true that the Germans experimented with infantry armor during World War I, most of the combatant nations — including Germany — found heavy armor to be impractical and never deployed it outside of static fortifications. Let’s round things out with a look at the weapons in the first promotional images DICE made available following the trailer’s debut. They show a man armed with a trench club in one hand, the iconic Mauser C96 in the other and a Bergmann MP18 submachine gun — complete with a trommel magazine slung at his side! No doubt, once Battlefield 1 drops in October 2016, we’ll also see BARs, Chauchats, Lebels, Lugers and a host of Maxim guns. But what about more obscure weapons? Perhaps an Italian Villar Perosa, a French RSC 1917, a British Webley automatic or even a Pedersen Device jutting out of an M1903 Springfield.